WHILE most people right now are looking for extra layers to put onto our heads, there’s one man in town who’s gone and done the opposite! 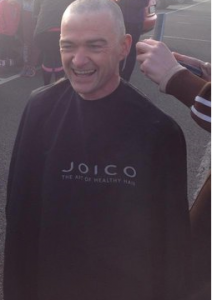 Denis ‘Den’ McCarthy, originally from Tipperary, but now living in Ballyrickard, bravely took the decision to have his head fully shaved for ‘Today Fm’s Shave or Dye Or Oh My!’ campaign. He had his head shaved yesterday in the car park of Tralee Wetlands watched by fellow members of the Born To Run club. Now in its sixth year, the annual fundraiser helps to raise raises funds for the Irish Cancer Society’s free cancer services, such as the Daffodil Centres located across the country. We got the chance to talk to Den today about his recent fashion choice and his reasoning behind exposing his head to the elements. “I just thought that at this stage that I don’t care what I look like, I’ll just shave the head, raise some awareness and have a bit of fun while doing it,” he said. Den’ is part of the local running group ‘Born To Run’ here in town and he admits that being a part of this great group of people was a major factor in his decision to ‘chop the mop’. “I must admit that the lads that turned up yesterday, they just made it so much fun. It was fantastic. I must admit that, I suppose that if I wasn’t in ‘Born To Run’, I probably wouldn’t even have ever considered doing it,” he said. 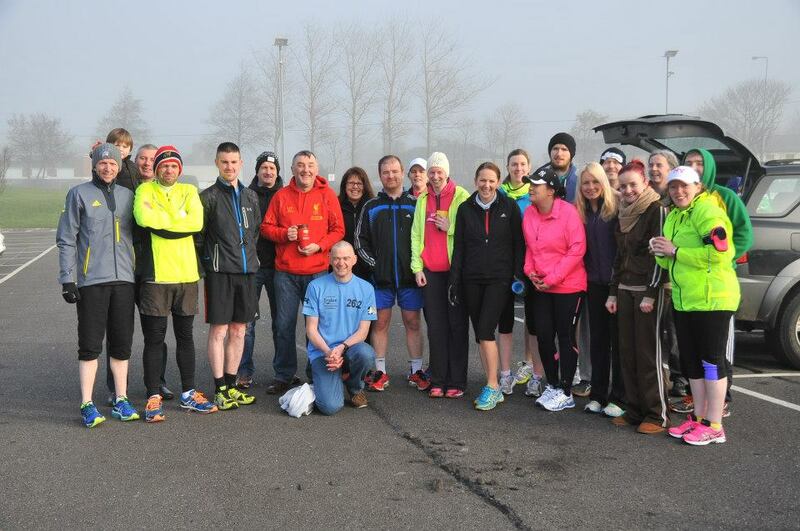 At the moment, Den has a target figure of €300, of which he has already raised €90 so far. Through his work with various garages though, he hopes to raise more than this. He admits as well that he’s going to have great fun visiting his colleagues who have yet to see his new ‘look’. This in itself will help to raise the awareness of what he, and many others around the country are doing through this campaign. For Den’s sake, we hope that there’s a few warm days on the horizon at least. If you would like to donate to Den’s cause, all the information can be found on his donation page here. Any information that you might like on the ‘Shave or Dye or Oh My!’ campaign can be found here. Den was keen to point out again the importance of ‘Born To Run’ in his campaign and, as thanks, he wanted to highlight that a new system is in place for the group for anyone that wanted to join back up. “About 12 of us have put together a rota to cover for Marcus while he takes a break to concentrate on his studies. There will be at least 2 people to cover each training group. The ‘leader’ will run at 11m/mile and the ‘sweeper’ will accompany the last person home. The aim would be to get those people who felt a bit isolated or not part of it, back to the group,” he said.